With the absence of any English language coverage to start the 2016 Super GT season, I decided to do something about it – and did an entire solo commentary of the entire 2016 Fuji 500km, held May 4th at Fuji Speedway. This race has a bit of everything – including several landmark milestone achievements, a fair dose of drama and atrition, fantastic racing action throughout, and an incredible finish featuring some of the world’s best racing drivers. There was even a fantastic report of the race written by Pierre Laurent-Ribault for Speedhunters.com – with some incredible, up-close photos of the brilliant machines. The early feedback to this commentary has been overwhelming, and I’m admit I’m taken aback by some of the positive comments, not just from avid fans of Super GT racing, but also from people who aren’t familiar with the series at all, and even one dear friend of mine who isn’t even in to racing. Already I am receiving requests to do future rounds, and add secondary commentators – I can’t give a solid commitment to it just yet, but it is something that I am strongly considering. And if the powers that be are willing, I would be honored to lend my abilities to an official broadcast team at any point in the near future. A special thanks goes out to the community at Racing4Everyone for putting my commentary to pictures and giving me a platform to showcase my strengths as an announcer. Thanks also to the Super GT Reddit community for their support, to RaceDepartment who have been gracious enough to allow me to serve as a commentator for top-level online racing leagues. It’s the second-biggest race of the Super GT calendar, and it happens during one of Japan’s biggest holiday celebrations. The Fuji 500 Kilometer race, a tradition of the Golden Week holidays for over twenty years, will run exactly one week from today – on a Wednesday, May 4. There are motor races that are so deeply synonymous with a holiday in North America: Memorial Day has both the Indianapolis 500 and the Coca-Cola/World 600 at Charlotte, American Independence Day is the season of the Coke Zero/Firecracker 400 at Daytona, and Labor Day has, for the better part of 65 years, been linked to the Southern 500 at Darlington. And the ties to the Fuji 500km and the Golden Week holiday are no different. Specifically, it’s the date of May 4, a date that for many years fell between two official holidays and was, in itself, declared a holiday. For most of the last twenty-two years, the Fuji 500km has been held on this date – no matter what day of the week it occurs. 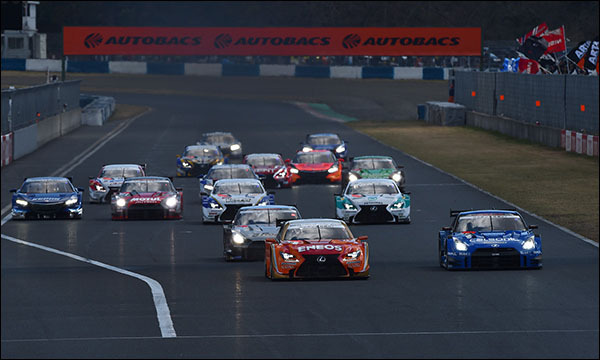 If you’ve been missing this year’s Super GT championship, you’ve been missing out on the best multi-class sports car racing action in the world, honestly. It’s been a big year for Super GT’s GT500 class, as new regulations meant to unify the class with the machines of the DTM series in Europe mean that the world’s fastest silhouette sports car class has gotten even faster, with new engines producing over 600 brake horsepower and new lap records being set at every single event. In addition, Honda has revived the legendary NSX brand, and Lexus’s new challenger, the RC-F, looks mean and is wicked fast. Nissan’s flagship GT-R model has been revamped to conform with the new regulations as well. There’s a true rivalry between the big three manufacturers of Japan here that’s reminiscent of the manufacturer rivalries anywhere else. Meanwhile in the GT300 class, FIA GT3-spec cars from BMW, Mercedes-Benz, Aston Martin, Nissan, Audi, Porsche, and McLaren compete against purpose-built GT300 cars based on the likes of the Subaru BRZ, Honda CR-Z, and even a Toyota Prius. If you’re a racing fan who loves a large variety of cars mixing it up, this is the class you want to watch, and it’s just as awesome as GT500. Does Blancpain GT have a Toyota Prius powered by a 3.4 liter V8 engine attached to a hybrid powertrain mixing it up with the BMW Z4s and McLaren MP4-12Cs? I rest my case. With one round remaining in the championship and both class titles up for grabs at Twin Ring Motegi, there’s no better time to catch up than right freaking now. And thanks to the power of new media, you could marathon the first seven rounds of the championship in two days tops. Rounds 1 through 7 have been subtitled by Yu Omori, who in addition to working as an everyman for Rehagen Racing in the Pirelli World Challenge, also runs the /r/super_gt subreddit – and I can’t thank him enough for offering to subtitle the original Japanese broadcasts for this season. For the most recent round of the championship, a bombshell was dropped when Radio Le Mans – yes, the same crew that calls the 24 Hours of Le Mans, the World Endurance Championship, the European Le Mans Series and also hosts Midweek Motorsport – announced they would be calling the Suzuka 1000km, the series’ marquee event, and thanks to NISMO you can watch it on YouTube in its entirety, all six hours’ worth, with English commentary provided by lead man John Hindhaugh, Graham Goodwin of DailySportsCar.com, and Sam Collins of Racecar Engineering (though geographic restrictions may apply). I’ll add the final two rounds of the championship from Twin Ring Motegi when they happen, but until then, do take a few hours out of your free time and catch up on what has been a great season for Super GT so far. A Motorsports Blog Blog at WordPress.com.